The Design of Everyday Things is a best selling book by cognitive scientist and usability engineer Donald A Norman. Originally published in 1988 as “The Psychology of Everyday Things”, the emphasis of his book is on people, and how we, as human beings, interact with psychical objects. Did you ever stand in front of a door, completely clueless on how to open it? Did you ever try to add someone to your list of contacts on the mobile phone, taking about 10 minutes to finally figure it out and blaming yourself for being clumsy? Then it is time to read a book about product design in the context of user experience. The Design of Everyday Things should be in every UX Designer’s shelve. 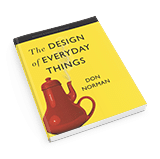 In The Design of Everyday Things (or DOET), Donald Norman explores the fundamental design principles through human interactions with everyday things such as doors, telephones, light and power switches. Still feeling clumsy or is it the product? As Norman explains: “User error is really a problem of bad design.”. Maybe just a few fun examples: “Remote control of the home is a popular fantasy among technologists. Why not, they muse, call your home while you are driving and turn on the heat or air conditioning … ” or “Wouldn’t it be great if we all had small screens we could carry around?”. It was interesting to see how design has evolved over 25 years; I almost felt like a time traveler. Donald A Norman wrote a very amusing and useful guidebook (and a classic) for the understanding of basic user-centric design in products. One of the many reasons why I have included The Design of Everyday Things in my online book collection. An absolute must read for every designer and I would highly recommend it to any product designer. The Design of Everyday Things is an excellent guidebook (and a classic) for the understanding of basic user-centric design in products, fixtures, software, and the everyday things that make up our world. One of my favorite things about this book is Norman’s discussion of affordances (the idea that an object’s appearance indicates how to use it). Sadly, this idea seems lost to many designers of flat UI’s, where you can’t tell what parts are clickable, swipable, etc. I wish more designers would add little touches to their interfaces to give clues about an object’s affordances. For example, adding little grooves to a panel to indicate swipability. I agree with you and believe that any good UI/UX designer should know these “tricks” (knowledge) to improve the interface’s usability. Little reading tip: Andrew Maier, co-author at uxbooth, had a great presentation about affordances in modern web design. Slightly outdated but interesting nevertheless. The book has recently been updated. Don had, in fact said that there were changes in technology that were the primary (though not only) reason besides it’s age to update it, but in spite of the new technologies and the cultural and paradigm shifts since then, the fundamentals of good design are still the same. Hi Robert, thanks for letting me know. I was unaware of the update and will put it on my to-do list.